Organic sugar and extra-rich Illinois cream are blended with local wildflower honey and organic agave - NO corn syrup - for our silky-smooth caramel. A dash of sea salt and real vanilla makes them irresistibly delicious. Deeply roasted walnuts and intense Guittard chocolate are added to our classic caramel. The complex flavors of roasted nuts and honeyed chocolate caramel make this Katherine's personal favorite caramel. 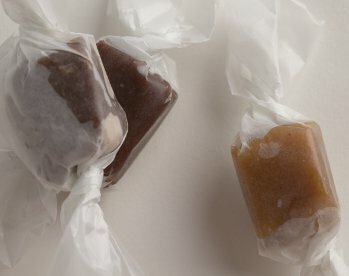 For those who might be doubtful about the wonders of mixing salty and sweet flavors, or who have backed off from treats that employ herbs more commonly used in cooking the main course instead of the dessert, our rosemary sea salt caramels are the perfect introduction. It will open a whole new world of flavor combinations.